With a lot of people getting their results recently and heading off to university in September, I thought I'd do something a bit different to beauty. I'm going in to my second year, so I feel I have somewhat of enough experience to offer some tips I feel could be useful to some people starting their first year of university. 1. Talk to everyone. If you're in a flat and someone new walks in say hi. You're not going to get on with everyone, but unless you speak to everyone how do you know who you do want to be friends with? If they don't like you, it's not harmed you by at least being the one to make an effort and introduce yourself, there's thousands of other students who are willing to be your friend. 2. Don't feel your flatmates have to be your best friends. I was lucky that I lived with three friends from sixth form in my first year of university, but 99% of people won't be that lucky and will be put with complete strangers. I lived with 2 strangers and felt I got on with them well, but if you don't, so what? You've only got to live with them for one year of your entire life, you can make your own friends and so can they. As long as you can be civil that's all that matters. 3. Go to your freshers fairs. Most of the stuff you get given is absolute rubbish but there are some reasons to go. 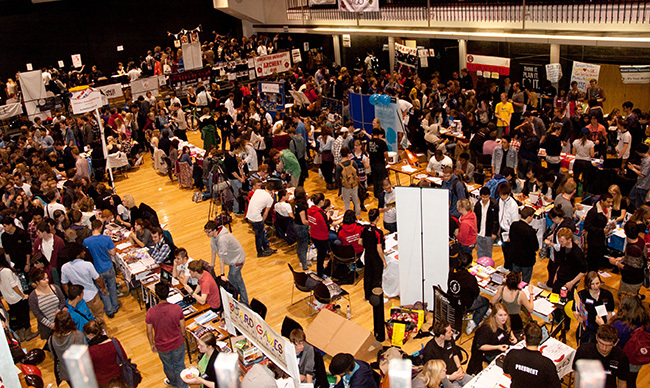 It gives you the chance to sign up to any societies or clubs you want to join and meet members early. There's voucher booklets available, which actually have some pretty good vouchers in, mine last year had vouchers for half price Barburrito's and chinese buffets, free shots and free entry to places. There was also free Dominos, which you could keep going back for, I think that alone is a good enough reason to go. 4. Actually try your hardest. It's true, you do only need 40% to get in to the second year, but is that really the grade you want to tell your family? You've worked hard to get to university, so why stop now? I was on a course I hated for my first year and so for the first semester I didn't show much interest, however for the second semester I feel I put a lot more effort in and came out with a 2:1, so it does pay off. It also benefits your future years of education, if your course does allow you to do a placement year most of them require you to be on target for at least a 2:1, so you don't really want to miss out on a years paid work experience at the cost of a silly first year. Even if work experience isn't part of your course, do you really think your lecturers will recommend you for any work experience that does pop up if you only got a pass? It's unlikely! 5. Don't worry if it isn't what you expected. Like I said, I hated my course and decided that within 3 weeks of being there but didn't speak to anyone until it was too late. It was eventually sorted and I had to stay for a full year on a course I didn't like before I could move on to the second year of a course that I will hopefully love. But if you feel like it's not for you, speak to someone straight away, you don't want to be stuck on a course you don't like for a year like me, nor do you want thousands of pounds worth of debt from a course you quit after the first year. There are people that are more than happy to help you! 6. Don't restrict yourself too much. By this I don't mean going out and buying a new laptop and PS4 as soon as you get your loan in, but spending an extra fiver on the takeaway you really want isn't going to harm anybody. You're going to come out of university with about £40,000 worth of debt, what's an extra Domino's on top of that? Most people are going to need some form of a budget, but if you do go over it it's not the end of the world, you won't notice in ten years time! 7. Pick the best student account for you. There's loads of different accounts for students that it's easy to pick the first one, but look at the different overdrafts and perks each one has. I knew I wouldn't really need one for the overdraft, so I went with Santander to get a free railcard, which over the year has probably saved me close to £100! But if you know you're careless with your money look at banks which offer a big overdraft, only if you know you can afford to pay it back! Finally, just have fun! This is the last time you're going to be a carefree student who doesn't need to worry about rent, tax and getting a job, so enjoy it whilst you can! It's a time you'll never get back and you don't want your last 3 years of freedom from the real world to be a living hell! Good luck to anyone starting university, I'm sure you'll love it and I hope my tips were of some use to you! Aw I already did my frosh year and what you said is so true! Check out my back 2 school makeup tutorial!